Drowning of Joris Wippe, Dordrecht, 1558. 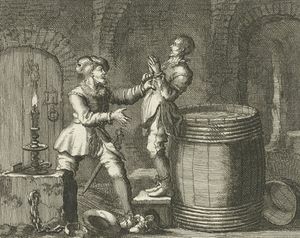 Engraving by Jan Luiken in Martyrs' Mirror, v. 2, p. 203 of Dutch edition. Joris (Joostenszoon) Wippe was an Anabaptist martyr drowned at Dordrecht, Dutch province of South Holland, on 1 October 1558. He was a native of Meenen in Flanders, Belgium. Van Braght's statement that he had formerly been a burgomaster of Meenen has proved incorrect; in the list of burgomasters of Meenen his name is not found. After his conversion he immigrated to Dordrecht in the Netherlands, adopting the trade of cloth-dyeing. He was a charitable man who dealt generously with the poor, widows, and orphans. On 28 April 1558 he was arrested at Dordrecht and soon sent to The Hague for trial. After some time he was returned to Dordrecht, where he was sentenced to death by drowning on 4 August 1558. The execution was postponed because the executioner refused to put to death a man who was renowned for his goodness. Not until October, after much hesitation, was he secretly drowned in a wine cask. The Dutch martyr books have preserved three letters by Joris Wippe: the first two were written to his wife from prison in The Hague; the third, a striking letter to his children, was written from the Vuylpoort prison at Dordrecht after he had been sent back to Dordrecht. All the letters are undated. Braght, Thieleman J. van. Het Bloedigh Tooneel of Martelaers Spiegel der Doopsgesinde of Weereloose Christenen, Die om 't getuygenis van Jesus haren Salighmaker geleden hebben ende gedood zijn van Christi tijd of tot desen tijd toe. Den Tweeden Druk. Amsterdam: Hieronymus Sweerts, 1685: Part II, 203. Braght, Thieleman J. van. The Bloody Theatre or Martyrs' Mirror of the Defenseless Christians Who Baptized Only upon Confession of Faith and Who Suffered and Died for the Testimony of Jesus Their Saviour . . . to the Year A.D. 1660. Scottdale, PA: Herald Press, 1951: 551, 584, 926. Available online at: http://www.homecomers.org/mirror/index.htm. Verheyden, A. L. E. "Mennisme in Vlaanderen." Unpublished mss. Zijpp, Nanne van der. "Joris Wippe (d. 1558)." Global Anabaptist Mennonite Encyclopedia Online. 1957. Web. 24 Apr 2019. http://gameo.org/index.php?title=Joris_Wippe_(d._1558)&oldid=141560. Zijpp, Nanne van der. (1957). Joris Wippe (d. 1558). Global Anabaptist Mennonite Encyclopedia Online. Retrieved 24 April 2019, from http://gameo.org/index.php?title=Joris_Wippe_(d._1558)&oldid=141560. Adapted by permission of Herald Press, Harrisonburg, Virginia, from Mennonite Encyclopedia, Vol. 3, p. 123. All rights reserved. This page was last modified on 3 December 2016, at 02:01.